Gasmask Can for the Wehrmacht and the Waffen SS. Made of aluminum and painted in feldgrau. Complete with strap, has a small compartment for the filter mask. 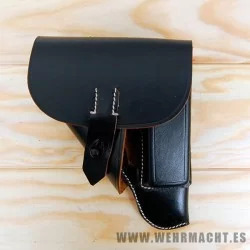 Holster for Luger P08. Made in hard black Leather with manufacturing marks. 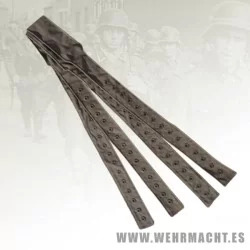 For Wehrmacht and Waffen SS. NOT VALID FOR ARTILLERY LUGER OR KRIEGMARINE LUGER. 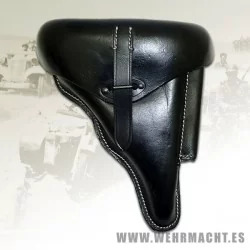 Holster for Walther P38. Made in hard black Leather with manufacturing marks. For Wehrmacht and Waffen SS. 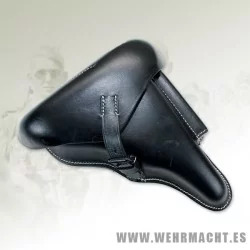 Holster for Walther PPK. Made in hard black Leather with manufacturing marks. 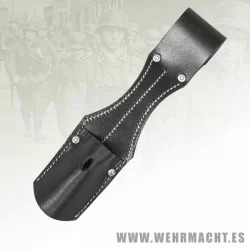 Used by german police and gestapo. These are for the M36, SS M37, SSM39, M40 and M41 field blouses. They look simple but are very hard to make. Internal suspenders come standard in all our field blouses that require them. 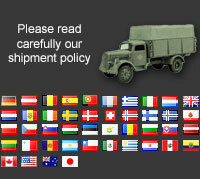 If you had purchcased one of the afore mentioned field blouse models from another manufacturer, you can complete it! These are sold ONLY in pairs. 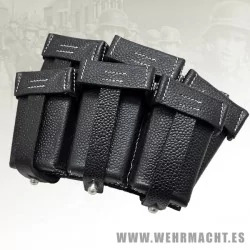 K98 black Leather Ammo Pouches. Price by pair. 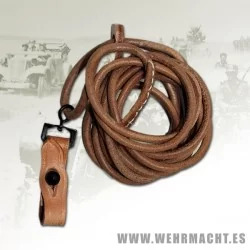 Leather belt for Luger P08, with metal hook. 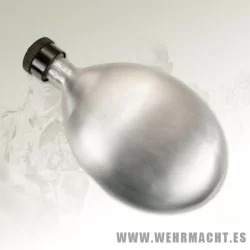 Standard German 750ml water bottle used throughout WW2. This copy is made of aluminum with manufacturer marks. The tampon is made of plastic and inside has a rubber to prevent water loss. 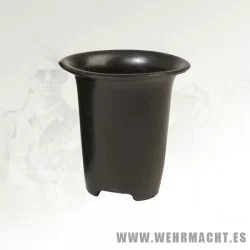 Reproduction of the cup used on both 750ml and 1 liter canteens throughout the War. Black Painted. 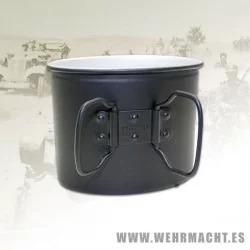 Reproduction of the cup used on both 750ml and 1 liter canteens throughout the War. Black plastic.